The natural fragrance and beauty of a potpourri crafted from flowers and herbs harvested from your summer garden will lift your spirits throughout the cold winter months. There are two traditional ways of making potpourri, the dry method or the moist.” The moist method is the oldest way of making potpourri. Partially dried herbs and flowers were packed and preserved in alternate layers of salt in covered ceramic pots set aside to cure or rot for weeks or months, this method is more fragrant but lacks visual appeal. 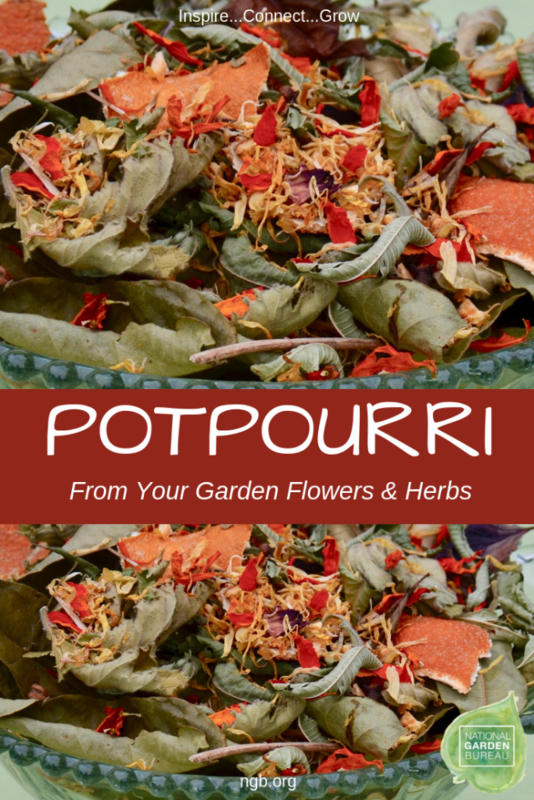 So it’s no surprise the original French word pot pourri means “rotten pot”. 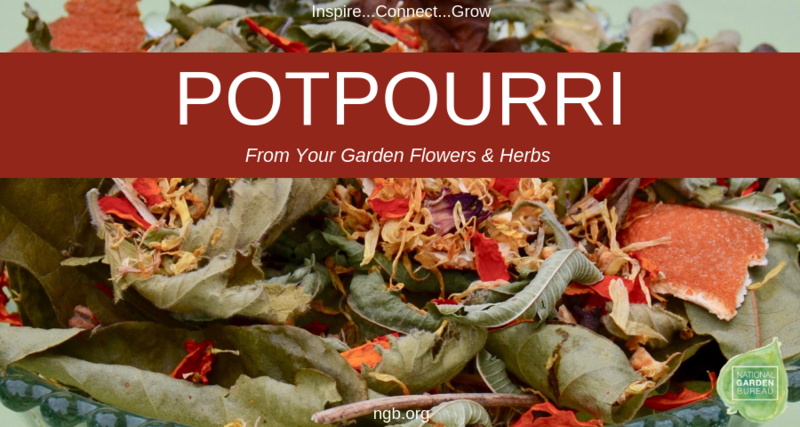 The dry method described here is more popular with potpourri crafters today. 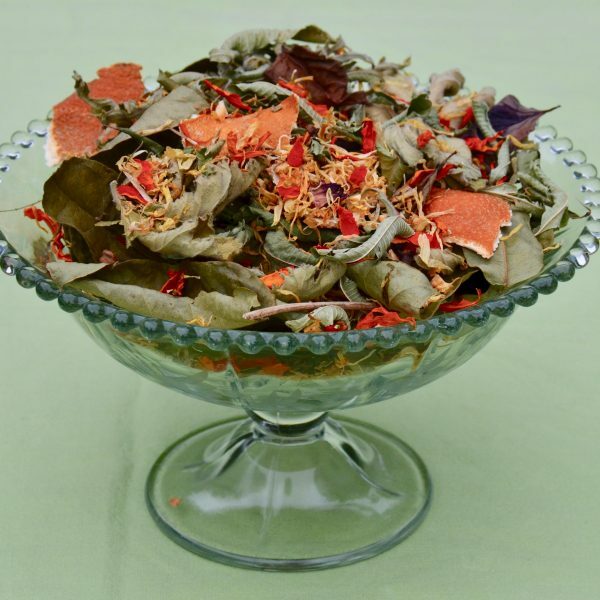 This potpourri of dried herbs and spices may include flower petals or blossoms, leaves, seeds, barks, and roots. Dried Citrus peel is often added for color and scent as well. 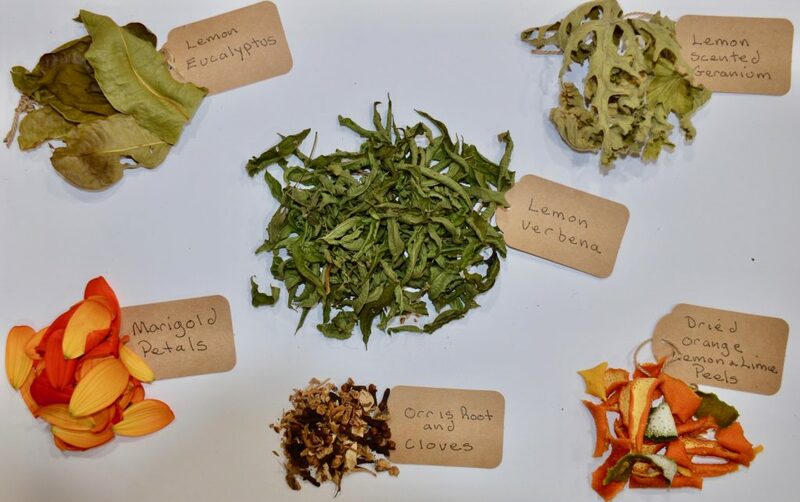 There are no precise rules in the choice or proportion of ingredients, creating a potpourri recipe is an art based on personal taste and discretion. You can follow a recipe or follow your nose. Mixtures can depend solely on the natural scents of their ingredients, or enhanced with fixatives and essential oils. 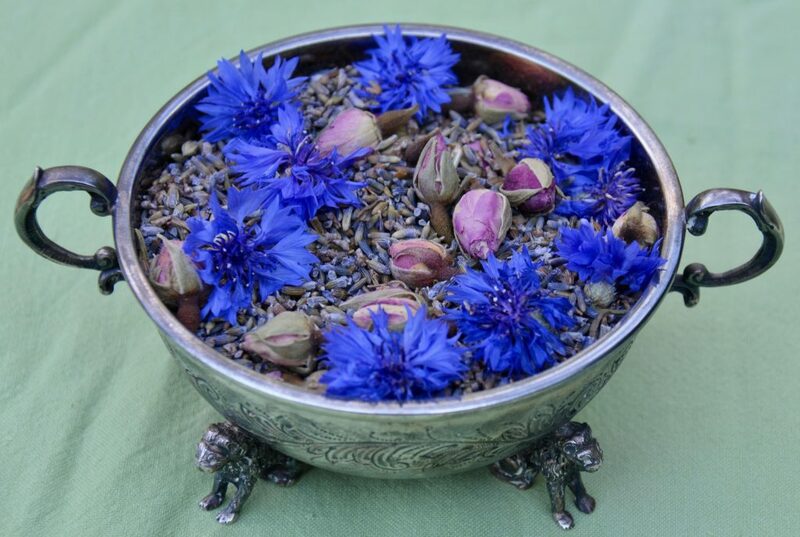 Fixatives help capture and preserve the volatile oils in the herbs and flowers and prolong the life of the potpourri. Essential oils are concentrated aromatic plant distillates. 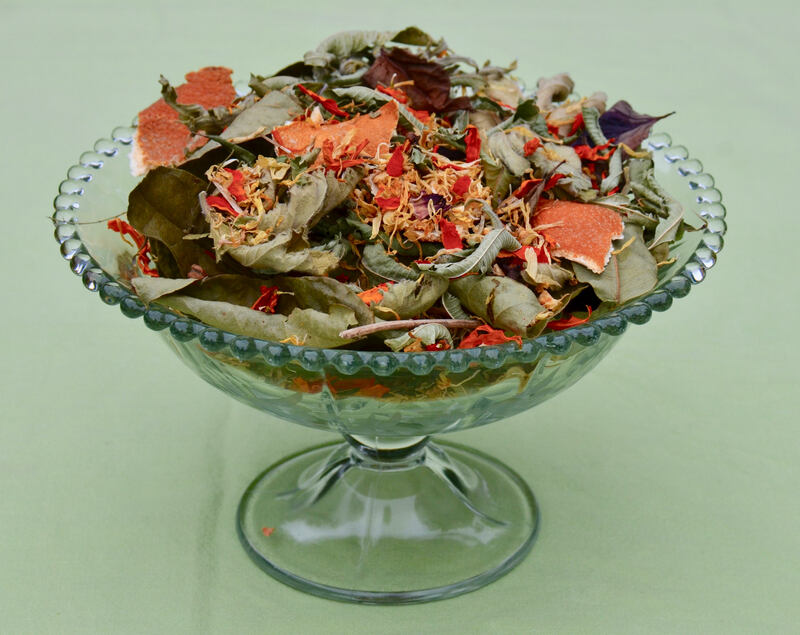 A basic guideline for blending potpourri is one quart of dried materials, three tablespoons of orris root or other fixatives, one teaspoon of essential oil and three tablespoons of spices. All materials must be chip dry. Blend orris root, spices, and oils in a glass jar and let “rest” for 3-4 days. After this period of time add the flower petals and herb leaves in a stainless steel bowl. Mix thoroughly and store in a glass jar with a tight-fitting lid for 4 to 6 weeks. Stir once or twice a week. 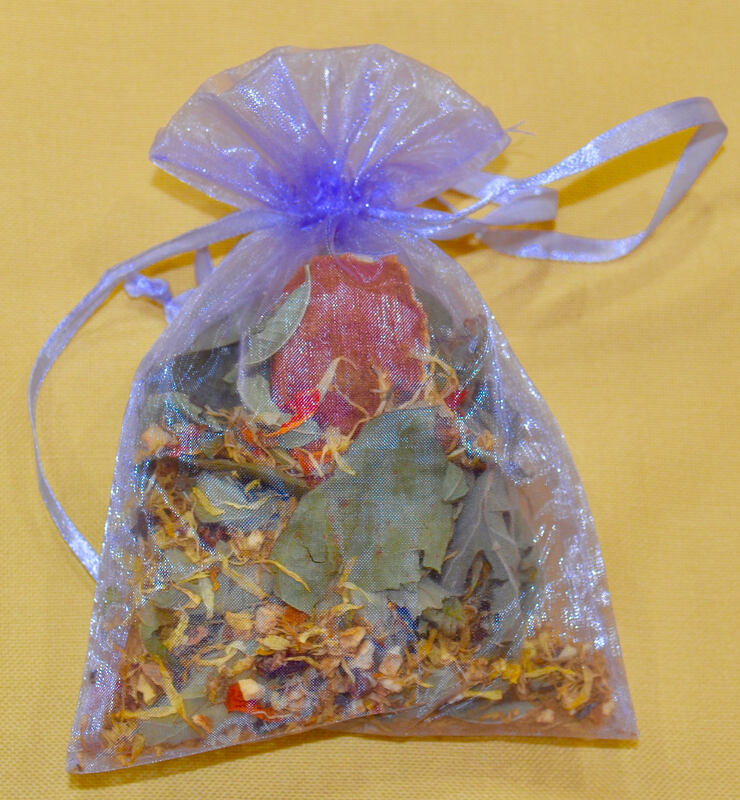 When ready, place this colorful and fragrant blend in sachet bags or display in a bowl on the table. I like to follow my nose; my favorite mix is a refreshing citrus-scented potpourri based on a combination of dried lemon verbena, lemon geraniums, and lemon eucalyptus. 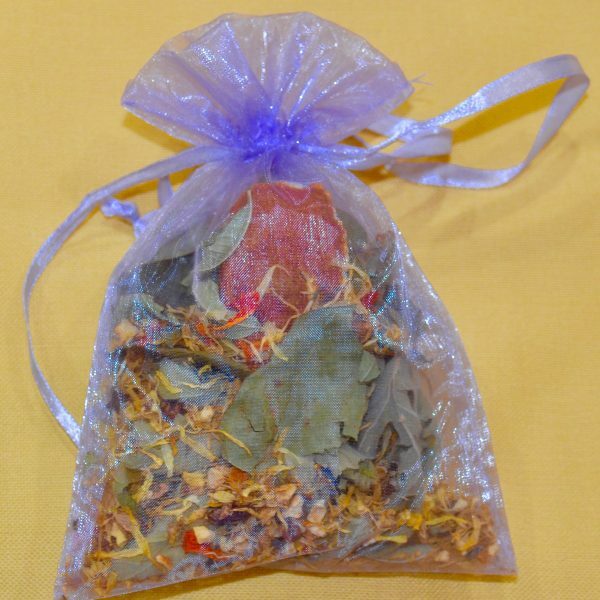 This mixture is then accented with marigold petals, orange peel, cloves, and orris root mixed with sweet orange oil. These plants are definites in my garden every year. As summer and fall progress, harvest, strip the foliage from the stems and layer the leaves on screens to dry. I also dry orange, lemon and lime peels. Store these in glass jars until ready to use.